Free range vs Caged eggs: What do consumers want? How do you like your eggs in the morning? Well, it might depend on where in Australia you happen to live. And we’re not talking about fried, scrambled or poached. Canstar Blue research shows there is a big difference in egg-purchasing preferences across the states, with consumers split over whether to buy free range or cheaper, caged eggs. Eggs have been the subject of a complex debate in recent months, with confusion over labelling laws and what does or doesn’t constitute a ‘free range’ egg. In light of this, Canstar Blue sought to find out what Australian consumers think – and which type of eggs they prefer to buy. The results were fascinating. Out of the 3,000 respondents, 2,599 (roughly 87%) had bought eggs from a supermarket or grocer in the last three months. 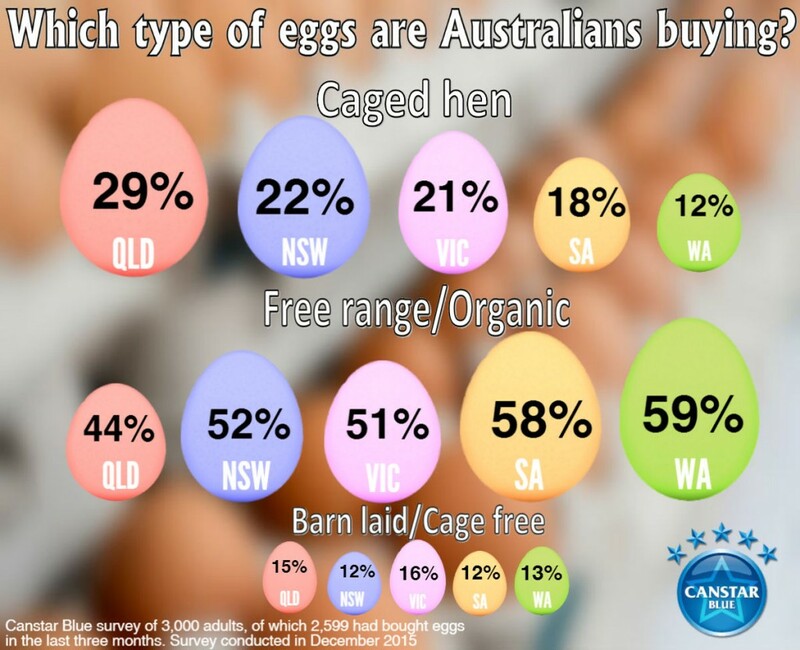 Of those people, the majority (51%) were found to favour free range / organic eggs, while 22% said they buy caged eggs. A further 14% go for the middle ground of barn laid / cage free eggs and the remaining 13% were unsure which type they buy. Given the recent focus on free range eggs, with debate about whether or not retailers should even sell caged eggs, it’s little surprise that the majority of consumers are opting to buy free range. That said, 22% is still a significant demand to be met. It’s the difference in purchasing behaviour between the states that has come as a surprise. The survey found that consumers in Queensland are significantly more likely to buy caged eggs than those in any other part of the country – 29% compared to the national average of 22%. In fact, the Queensland figure is more than double the number in Western Australia, where just 12% of respondents choose caged eggs. In New South Wales the outcome was 22%, Victoria 21% and South Australia 18%. You therefore won’t be surprised to learn that Queenslanders were found to be least likely to buy free range eggs – 44% compared to the national average of 51%. Consumers in Western Australia (59%) and South Australia (58%) were most likely to buy free range. The figure for New South Wales was 52% and Victoria 51%. So why do people choose to buy either caged or free range eggs? Is it all about the chooks, or the cost? As you might expect, the vast majority of consumers (94%) agreed that they buy caged eggs because they are cheap, but almost all of them (90%) said they would switch to free range eggs if they cost less. Just 29% said they feel guilty about buying caged eggs. Interestingly, given their preference for caged eggs, Queenslanders were most likely to feel guilty (33%) about buying them. Consumers in New South Wales and South Australia (24%) were least likely to feel bad. Queenslanders were also most likely to say they would buy free range eggs if they were cheaper (93%). Victorians (87%) were least likely to agree. The majority of survey respondents agreed that they buy free range eggs because they are better quality (86%). But what’s fascinating is that even more consumers (90%) cited not wanting to support the caged egg industry as a reason for buying free range. Not everyone is happy to pay more for free range eggs, but most are (84%). Once again the results from Queensland stand out, with adults in the state least likely to say better quality was a reason for buying free range (83%). That compares to 92% in South Australia. Consumers from Queensland were also least likely to say that not wanting to support the caged egg industry was a reason (87%) for buying free range. Again, South Australians were most likely (93%). Finally, 81% of Queenslanders who buy free range eggs said they are happy to pay more for them. This time, consumers in Western Australia (80%) were least likely to agree, with Victorians (87%) most likely. Consumers are clearly faced with something of a moral dilemma when they buy eggs. Our research shows that the majority are favouring free range eggs and even most of those who buy caged eggs indicate that they would prefer to switch. Caged eggs generally cost half the price of branded free range eggs, although supermarket label free range eggs have narrowed the price gap. The emphasis is usually put on the industry to improve standards, but some of those on the front line insist that Australia’s huge demand for eggs simply can’t be met without caged eggs, with claims there could even be an “egg shortage” when supermarkets phase out caged eggs. That then raises concern about increased prices. 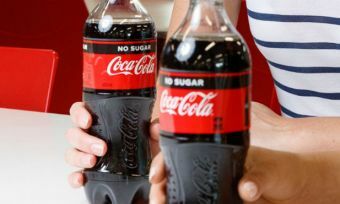 It’s a complex situation, but consumers are clear about what they would prefer. Whether or not they can afford it, or the industry can cater for it, is another matter. Food packaging health ratings: Are we using them?